They’re well educated. They’re original. They’re young. And they’re all University at Albany alumni and students! 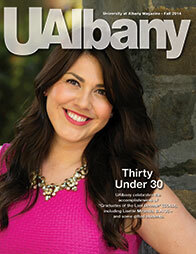 In this issue, we proudly present UAlbany magazine’s version of “Thirty Under 30,” a salute to some younger alumni – and future alumni – who have already accomplished great things. As both non-fiction writer and novelist, William Nothdurft, B.A.’70 – a.k.a. Will North – has enjoyed career success. “A doctor, a lawyer and a political consultant walk into a bar” … and exit with a plan to start their own business. Meet the aforementioned attorney, Steve Cox, B.A.’81, co-founder of Utica, N.Y.-based Adirondack Distilling Company. UAlbany Football Head Coach Greg Gattuso is looking forward to his first season with the Great Danes. University at Albany Director of Financial Aid Diane Corbett offers some common-sense advice for those who have student loans. UAlbany celebrates the accomplishments of "Graduates of the Last Decade" (GOLD), including Lisette Miranda, B.A. '06 - and some gifted students. 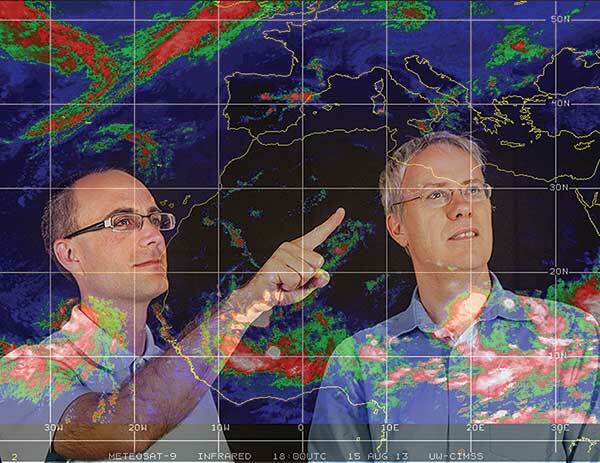 Chris Thorncroft and Ryan Torn are working to improve knowledge and understanding of African Easterly Waves (AEWs).